Virginia Woolf was born in London as the daughter of Julia Jackson Duckworth, a member of the Duckworth publishing family, and Leslie Stephen, a literary critic and friend of Meredith, Henry James, Tennyson, Matthew Arnold, and George Eliot, and the founder of the Dictionary of National Biography. Leslie Stephen's first wife had been the daughter of the novelist William Makepeace Thackeray. His daughter Laura from his first marriage was institutionalized because of mental retardation. In a memoir dated 1907, Virginia wrote of her parents, "Beautiful often, even to our eyes, were their gestures, their glances of pure and unutterable delight in each other." Woolf was educated at home by her father and grew up at the family home at Hyde Park Gate. In middle age she described this period in a letter to Vita Sackville-West: "Think how I was brought up! No school; mooning about alone among my father's books; never any chance to pick up all that goes on in schools—throwing balls; ragging; slang; vulgarities; scenes; jealousies!" Woolf's youth was shadowed by series of emotional shocks - her half-brother, Gerald Duckworth, sexually abused her, and her mother died when she was in her early teens. Stella Duckworth, her half sister, took her mother's place, but died a scant two years later. Leslie Stephen, her father, suffered a slow death from cancer. When her brother Toby died in 1906, Virginia had a prolonged mental breakdown. Following the death of her father in 1904, Woolf moved with her sister Vanessa and two brothers to the house in Bloomsbury, which would become central to activities of the Bloomsbury group. "And part of the charm of those Thursday evenings was that they were astonishingly abstract. It was not only that Moore's book Principia Ethica (1903) had set us all discussing philosophy, art, religion; it was that the atmosphere - if in spite of Hawtrey I may use that word - was abstract in the extreme. The young men I have named had no "manners" in the Hyde Park Gate sense. They criticized our arguments as severely as their own. They never seemed to notice how we were dressed or if we were nice looking or not." (from Moments of Being, ed. by Jeanne Schulkind, 1976) Vanessa agreed to marry the critic of art and literature Clive Bell. Virginia's economic situation improved when she inherited £2,500 from an aunt. From 1905 Woolf began to write for the Times Literary Supplement. 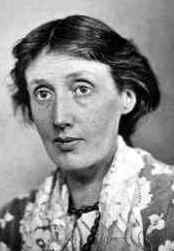 In 1912 she married the political theorist Leonard Woolf, who had returned from serving as an administrator in Ceylon (now Sri Lanka). Woolf published her first book, The Voyage Out, in 1915. In 1919 Night and Day appeared: a realistic novel set in London, contrasting the lives of two friends, Katherine and Mary. Jacob's Room (1922) was based upon the life and death of Virginia's brother, Toby. With To the Lighthouse (1927) and The Waves (1931),Woolf established herself as one of the leading writers of modernism. On the publication of To the Lighthouse, Lytton Strachey wrote: "It is really most unfortunate that she rules out copulation - not the ghost of it visible - so that her presentation of things becomes little more... than an arabesque - an exquisite arabesque, of course." The Waves is perhaps Woolf's most difficult novel. It follows, in soliloquies, the lives of six persons from childhood to old age. Louis Kronenberger noted in The New York Times that Woolf was not really concerned with people, but "the poetic symbols, of life -- the changing seasons, day and night, bread and wine, fire and cold, time and space, birth and death and change." In these works Woolf developed innovative literary techniques in order to reveal women's experience and find an alternative to the male-dominated views of reality. In her essay Mr. Bennett and Mrs. Brown, Woolf argued that John Galsworthy, H.G. Wells, and other realistic English novelists dealt in surfaces, but to get underneath these surfaces one must use less restricted presentation of life, and such devices as stream of consciousness and interior monologue, therefore abandoning linear narrative. Mrs. Dalloway (1925) formed a giant web of thoughts of several groups of people during the course of a single day. There is little action, but much movement in time from present to past and back again through the characters memories. The central figure, Clarissa Dalloway, is a wealthy London hostess. She spends her day in London preparing for her evening party. She recalls her life before World War I, before her marriage to Richard Dalloway, her friendship with the unconventional Sally Seton, and her relationship with Peter Walsh. Clarissa never meets the shell-shocked veteran Septimus Smith, one of the first Englishmen to enlist in the war, but Sally returns as Lady Rossetter, Peter Walsh is still enamored with Mrs. Dalloway, the prime minister arrives, and Smith commits suicide. To the Lighthouse had a tripartite structure: part one presented the Victorian family life, the second part covers a ten-year period, and the third part is a long account of a morning in which ghosts are laid to rest. The central figure in the novel, Mrs. Ramsay, was based on Woolf's mother. Also other characters in the book were drawn from Woolf's family memories. During the inter-war period, Woolf was at the center of literary society both in London and at her home in Rodmell, near Lewes, Sussex. She lived in Richmond from 1915 to 1924, in Bloomsbury from 1924 to 1939, and maintained the house in Rodmell from 1919-41. The Bloomsbury group was initially based at the Gordon Square residence of Virginia and her sister Vanessa (Bell). The consolidation of the group's beliefs in unifying aesthetic concerns occurred under the influence of the philosopher G.E. Moore (1873-1958). The group included among others E.M. Forster, Lytton Strachey, Clive Bell, Vanessa Bell, Duncan Grant, and Leonard Woolf. By the early 1930's, the group ceased to exist in its original form. In the event of a Nazi invasion, Woolf and Leonard had made provisions to kill themselves. After a final attack of mental illness, Woolf loaded her pockets with stones and drowned herself in the River Ouse near her Sussex home on March 28, 1941. On her note to her husband she wrote: "I have a feeling I shall go mad. I cannot go on longer in these terrible times. I hear voices and cannot concentrate on my work. I have fought against it but cannot fight any longer. I owe all my happiness to you but cannot go on and spoil your life." Her suicide has colored interpretations of her works, which have been read perhaps too straight-forwardly as explorations of her own traumas. Virginia Woolf's concern with feminist themes is dominant in A Room of One's Own (1929). In it she made her famous statement: "A woman must have money and a room of her own if she is to write fiction." The book originated from two expanded and revised lectures the author presented at Cambridge University's Newnham and Girton Colleges in October, 1928. It deals with the obstacles and prejudices that have hindered women writers, and analyzes the differences between women as objects of representation and women as authors of representation. Woolf argued that a change in the forms of literature was necessary, because most literature had been "made by men out of their own needs for their own uses." In the last chapter it explores the possibility of an androgynous mind. Woolf refers to Coleridge who said that a great mind is androgynous and states that when this fusion takes place the mind is fully fertilized and uses all its faculties. "Perhaps a mind that is purely masculine cannot create, any more than a mind that is purely feminine..." Three Guineas (1938) examined the necessity for women to make a claim for their own history and literature. Orlando (1928), a fantasy novel, traced the career of the androgynous protagonist from a masculine identity within the Elizabethan court to a feminine identity. The book was illustrated with pictures of Woolf's lover, Vita Sackville-West, dressed as Orlando. According to Nigel Nicolson, the initiative to start the affair came as much on Virginia's side as on the more experienced Vita's. Their relationship coincided with a period of great creative productivity in Woolf's career as a writer. In 1994 Eileen Atkins dramatized their letters in her play Vita and Virginia, starring Atkins and Vanessa Redgrave. As an essayist Woolf was prolific, publishing some five hundred essays in periodicals and collections, beginning in 1905. Characteristic for Woolf's essays are dialogic nature of style and continual questioning of opinion - her reader is often directly addressed, in a conversational tone, and her rejection of an authoritative voice links her essays to the tradition of Montaigne. Katharine Hilbery, the grand-daughter of a Victorian poet, must choose the poet William Rodney and Ralph Denham. Rachel Vinrace travels to South America and begins a transformation from a young girl into a mature young woman.